It's been a long, strange trip where this little box is concerned. When it first turned up as an unused "flat" in the collection of Kentucky-based collector Steve Denny, we called it the "mystery box" because no one could ascertain its purpose. Theories ranged from an unused package for the 12-figure display stand to a countertop display bin for bagged figures. But none of the explanations was ever totally satisfying. The mystery was eventually solved when some used examples turned up . . . inside of a shipping case housing Kenner's 1978-issue three-packs. The three-packs were loaded into the box in three rows, each of them three three-packs deep. The graphical nature of the box indicates that it wasn't meant simply as a shipping carton. Rather, it was intended to allow store owners to pull the trays out of the case and put them directly onto shelves, where the boxes would ensure the three-packs remained standing upright amidst the rest of Kenner's Star Wars product. Possibly, Kenner felt that stores would have difficulty displaying the heftier-than-normal three-packs on standard peg-based displays. I'm not aware of a such a box being used after 1978. 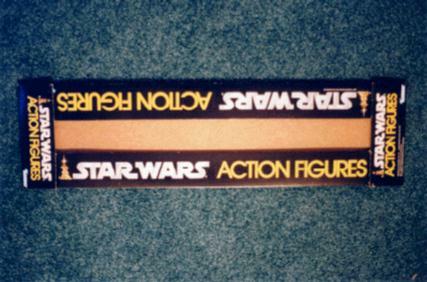 Presumably, later examples would lack the "LP" logo, here hidden below the box's folded-over side flaps. A Cromalin for the box can be seen here.